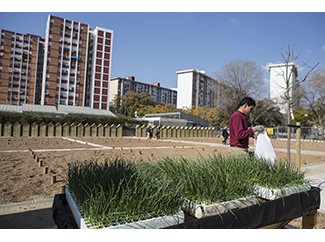 More than 100 activists already involved in seven projects of social and urban agriculture 'Cultivating Clima and Community 3C' implemented in six municipalities in Catalonia and Madrid. 3C is an ideal way to work with some of our partners municipalities tool. Some of them want to complement the activity of collecting textile we carry out with the launch of a 3C project in the municipality. Also a support for the residents, and a place to share experiences and knowledge. The municipalities participating in the program are San Agustin del Guadalix and Leganés (Madrid) and Tordera, Calella, Cornellà de Llobregat and Lliçà d'Amunt (Catalonia). It started two years ago with a pilot in Catalonia was an innovative project that must demonstrate its effectiveness to be replicated in other municipalities. Its success has been confirmed over time: one embryo has led to a consolidated one hundred participants in four municipalities of Catalonia and two of the Madrid program. "The intention is that this year continues to grow," says the coordinator of the initiative, Damiana Conde. 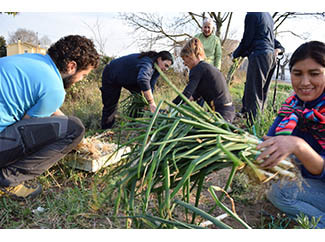 Based on the accumulated experience for 20 years with the agricultural and development projects in the South, Humana decided to create a program of social and urban agriculture in our country so that users and activists work an orchard where not only cultivate ecological products consumption but also strengthen social relations between them. He titled 'Cultivating Clima and Community 3C'. The garden is usually a land donated by the City where activists receive free education and training by technicians from the Foundation. The pilot was conceived in 2014 Lliçà d'Amunt, a small town of Barcelona, ? ?and since then we have added five social orchards more. Damiana Conde is very satisfied after the first two years of the program: "The balance is very positive. In most projects we are involved three parts: the corresponding town hall with the respective departments of environment and social services, activists and us. The involvement of municipalities is very high, we work shoulder to shoulder with them, from site selection to the user interviews, through collaboration in local promotional activities, such as round tables or workshops in a library. " Users are the cornerstone of 3C. 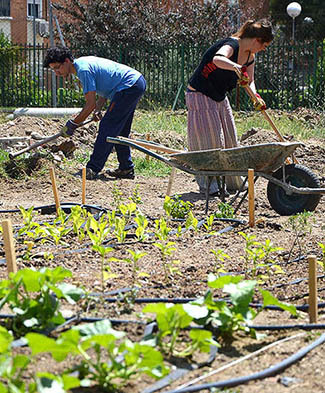 This program is aimed at any citizen to environmental concerns and want to grow vegetables and organic vegetables for their own consumption as well as to bond with others in your community. Also individuals derived from social services, since the garden can serve as a tool for inclusion and socialization. "Overall improved interpersonal relationships," said Conde, "and have also learned a lot thanks to the theoretical and practical activities on nutrition and organic farming." The profile of the activists is varied: some are retired, without financial resources, of different nationalities, in a situation of long-term unemployment ... In all human cases are interviewed in person before involving them in social garden: "We want to know their motivations , explain that this only works if there is a commitment by both parties, "says Conde. Later comes the work in the field, with theoretical and practical classes that in the medium term will result in the magnificent seasonal produce all they grow in their fields. Projects do not have an expiration date, if you stay by users: the 3C Lliçà d'Amunt and Leganés meet in June two years and will then be renewed activists.